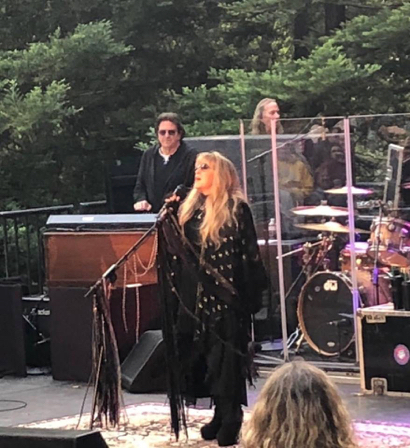 Stevie Nicks of Fleetwood Mac fame, returned to the Peninsula this past weekend to perform at a private party in the redwoods up the hill from Menlo Park. According to those in attendance, she talked to the audience that she had “a feeling of coming home.” That could be due to the fact that she attended Menlo-Atherton High School her senior year. She was strumming a guitar even then, as the photo taken from the the school’s 1966 yearbook attests. And yes, as most of the band’s followers know, she, along with class of ’67 grad, Lindsey Buckingham, contributed to Fleetwood Mac’s biggest hits. But if you are looking forward to seeing then together again, tough luck. Fleetwood Mac is touring this year but without Lindsey Buckingham, who the band fired in April. Also a former San Jose State Spartan. I LOVE NICKS/FLEETWOOD MAC! I HOPE I GET TO SEE THEM ONCE AGAIN, AT LEAST!